Unless you own a 4G LTE version of Kindle Fire HDX, Kindle Fire HDX is a Wi-Fi–only device, meaning that you have to connect to a nearby Wi-Fi network to go online. You might access a Wi-Fi connection through your home network, at work, or via a public hotspot, such as an Internet cafe or airport. Swipe down from the top of the Home screen to display Quick Settings, which reveals a menu of common settings, such as Quiet Time, Wireless, and Brightness. Wireless settings appear (see the following figure). 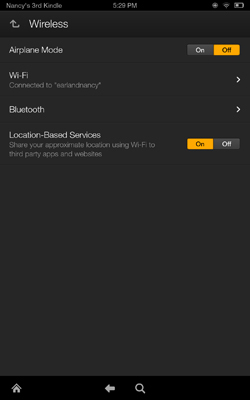 Wireless settings allow you to select an available network to join. Tap a network in the list of available wireless networks to sign in. You have to enter a password to sign in to some networks. If you’re already connected to a network when you tap it here, you get information about the connection (the signal strength, link speed, and so on).